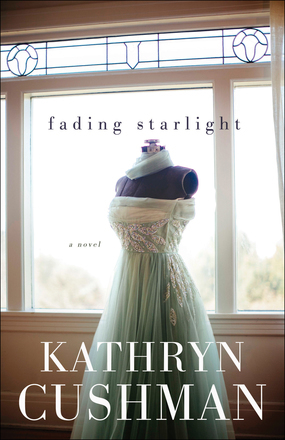 I'm pretty sure this is the first Kathryn Cushman novel I've read. I was drawn in by the synopsis as well as the cover. I hadn't read a contemporary novel, or really any novel, without a romance as the main part of the story. I have to tell you, not having a romance as a main element made this a very refreshing read! Let me say, for the record, that I received this book from Bethany House for review. I'll be sharing my personal opinion of the book after sharing the plot synopsis. You can also read an excerpt! How Far Will One Woman Go to Regain Her Dream? Lauren Summers is in hiding. Her fashion house internship was supposed to launch her career, but a red carpet accident has left her blackballed. The only job she can find comes with little pay, but at least it offers a free place to live--a rundown cottage in the shadow of a cliff-side mansion. Planning to live on savings until she figures out what's next, she's unprepared to be contacted by a reporter. Kendall Joiner is researching Charlotte Montgomery, a former Hollywood ingénue who lives a reclusive life in the cliff-side mansion. Rumors have swirled for decades about Charlotte, and now Kendall wants to find the real story. In return, she may just have the key to getting Lauren back into the fashion world. Desperate to get her life back on track, Lauren's not sure she can turn down the offer--but as she and Miss Montgomery get to know more about each other, Lauren realizes nothing is quite as it seems. I have to say, the thing I liked throughout this entire book is how relatable Lauren is. When her "big shot" isn't what she hopes, the reader cringes right along with her. Lauren's life becomes topsy turvy, and we go along with her ride. I found myself getting defensive for her, and down right angry at certain parts. Throughout the story, I really love how Rhonda (you'll get to know her a bit) encourages Lauren's faith, and speaks wisdom into her life. It was wonderful to see the people come around her and show her kindness when it seemed like all the world had to offer her was negativity. As for Kendall, I wasn't ready to be a fan of hers at the start of the story, because I tend to give certain characters the stink eye until I get to know them better. She plays a big role in helping Lauren figure out who she is as a person, and helps her become a stronger person. When you read the story, you'll understand better. I absolutely recommend this book! It was a super easy read, and I didn't want to put it down because it was just an enjoyable read! I may need to read this one. I tend to not like romance novels, which this one obviously is not. We all need a community that will lift us up, and it seems Lauren finds hers. Traces of Guilt is the one I really cant wait to read. My sister in law currently has the book so I gotta wait till shes done.. I like to read No Way up. It looks like a good read. I love Tracie Peterson so I would like to read A Beauty Refined. I would like to read Someone Like You. I am looking forward to reading The Atonement.